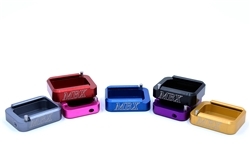 INTRODUCING The "NEW" 155mm open Class Magazine from MBX! Great Size and Balance for fast easy Reloads and Draws also Stages when that little extra is needed. Reloads like the "Little Stick" 141.25mm with close to the power of the "Big Stick" 171.25mm. The MBX extreme tube features designed body contour running the full length of the magazine for improved reliability and performance allowing for a wider follower to improve stability also featuring round location holes for 10 & 27 and precision cut feed lips. The mag would not feed 100% new. I left the mag full overnight to seat the spring. And still had feeding issues. The gun runs perfectly with 4 different sti mags. Giving 2 stars since I tried to contact MBX. They do not have a phone #, only email. So I emailed to see if they had a solution. I got no response to my emails, just crickets. So if you have a problem with their product , dont expect any customer service. Btw I did get the mag to run flawlessly. I ended up having to tune the feed lips! Response from Chuck- Glad you got them running good with your gun. Yes sometimes the variance in geometry between different mags, guns and ammo may require some tuning for your set up. Been doing ti with all makes of mags for 25 years myself. Something the new comers in the sport don't realize, they tend to expect everything to drop in a work across the board with every variable imaginable. Just not realistic. I don't think the 4 rating is fair. More of a jab at MBX for not responding to your email. I do agree sometimes it takes them some time since they are a small operation and go to matches so they are not always in the shop. These mags are great. I can fit 26 rounds in each of the 4 mags that I bought. They can still be reloaded at that round count as well. Be sure to watch their video on how to reload them though, it'll help with reliability and squeezing an extra couple rounds in there. Ran straight out of the bag! Shot a match straight out of the bag! Runs great and zero issues. The 155 mm seems to break my will. It seems impossible to make it work. I have several MBX Mags but I have to say that the 155mm was a mistake. Response from Chuck- Check your feedlips and compare to your others and adjust if necessary. If you still have a problem contact Adrian at MBX. He takes care of issues with his product.